Asociatia Neemia (AN) is a Romanian registered charity working in the northeast of Romania. 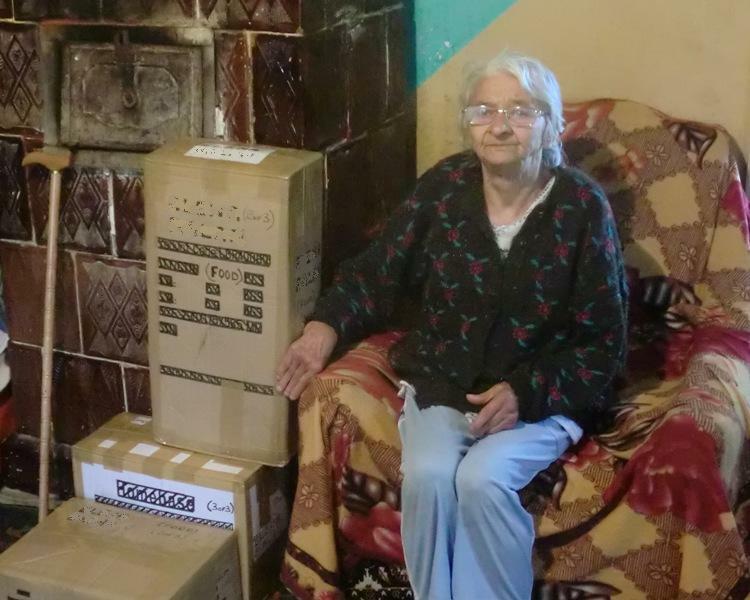 Since 1997 our main activity has been helping needy people an area covering the north of Botosani county and the east of Suceava county. With a population of some 300,000 and de facto unemployment around 50%, this is one of the poorest regions in Romania. AN has a separate management and governance structure, independent of its UK parent. We are accountable to the Romanian authorities and are recognised as an established charity both officially and by local social services providers. We have a good record of working with other charities. What services does AN provide to its beneficiaries? Donations of aid, including clothing, bedding, food, household items such as kitchenware and crockery, bicycles, computers, furniture. Cash donations, to help with medical costs, fuel bills, schooling, household expenses and emergencies. The services of a qualified social worker who keeps in touch with beneficiaries, assessing their situation and monitoring progress. Management of sponsorship arrangements and liaison with landlords. A listening ear and somewhere to turn for help when necessary. Distribution of Christmas gift boxes to families, schools and churches. L: Clothing, food, toys and other essentials are donated to needy families. C: Bicycles, computers and other items find a new usefulness with local people. 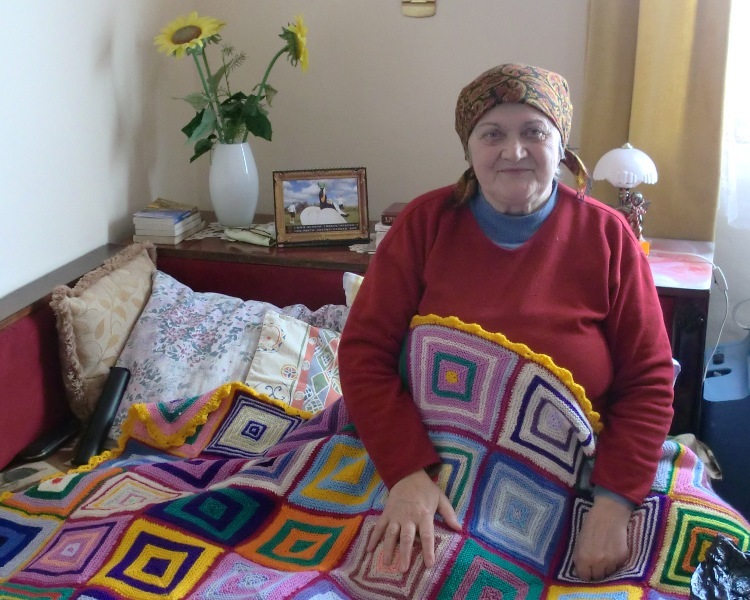 R: A knitted blanket brings a smile, and the opportunity to talk awhile. L: Designated boxes of clothing and food are delivered to their recipients. C: A new home brings a fresh start and new hope to a displaced family. 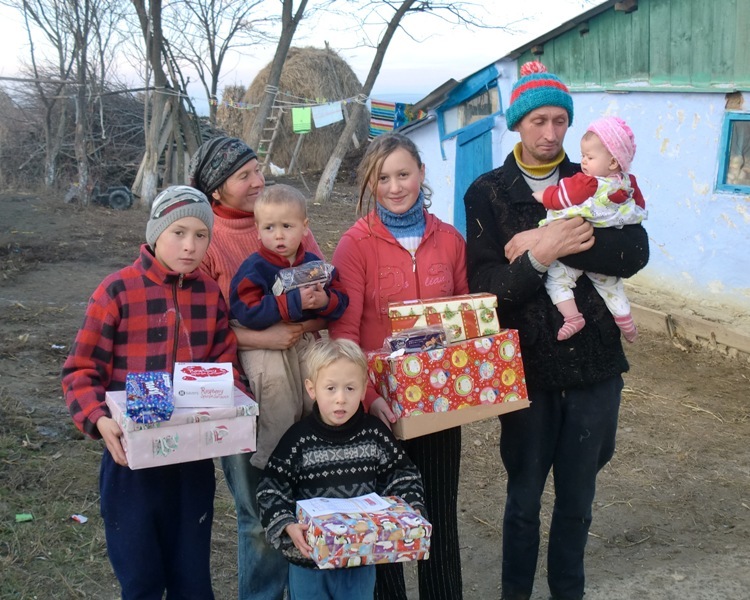 R: Christmas gift boxes are distributed to schools and needy families. Where does the aid come from? 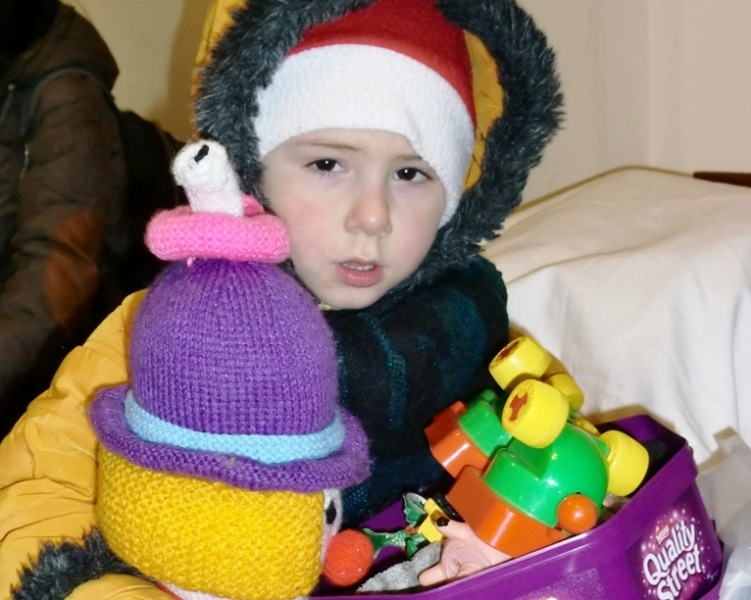 Aid items come primarily, but not exclusively, from the Romanian Aid Foundation (RoAF) which is a UK registered charity operating from three principal bases in Surrey, Lampeter and Swansea. RoAF also undertakes promotion on behalf of AN and co-ordinates the annual Christmas gift box appeal. Other suppliers in the UK or elsewhere in Europe provide aid, either directly or via their local interests in this area. Finally, AN also grows some crops itself, providing food for donation to our beneficiaries. What staff does AN have? AN has 6 full-time and 2 part-time paid employees, supported by 4 regular volunteers and 1 expatriate mentor. The range of skills includes management, accountancy, social services, electrical repairs, warehousing and shop-keeping. Additional personnel are available on an ad-hoc basis for specific tasks or to help with special projects. These skills include building, property renovation, plumbing, electrical installation, gardening and horticulture. What facilities does AN have? 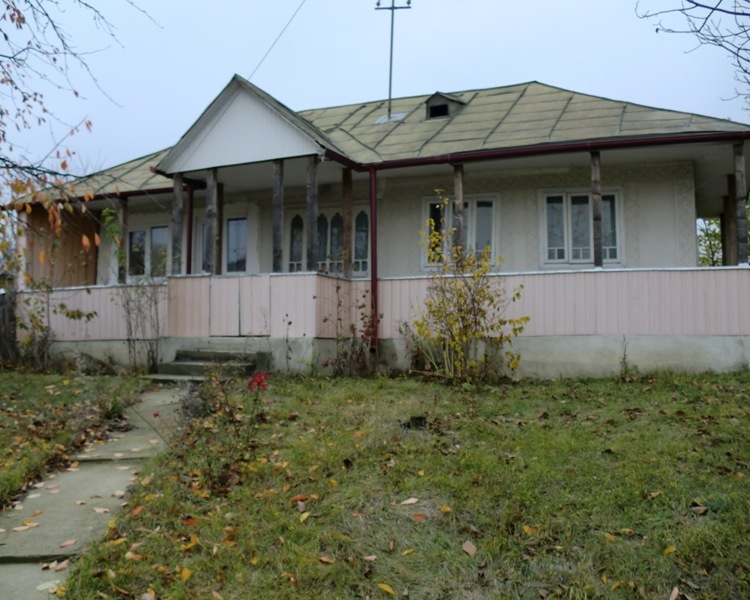 AN owns the freehold of an office suite in Dorohoi town plus a warehouse and agricultural land in a nearby village. The warehouse has a total floor area of some 400 mtr2 on two levels whilst the adjoining land is used for crops which are then donated to beneficiary families. AN owns a shop in Dorohoi. The proceeds from the shop underwrite the costs of aid distribution including salaries and operating costs. AN has two vehicles which are used for aid distribution and other activities; including one 4×4 which is necessary for access to more rural areas. In addition to our operation facilities we have a community house which provies accommodation for up to ten young people who have been brought up in the orphanage system. AN also holds the freehold of two village houses on behalf of sponsors in the UK. This is a scheme whereby selected families can maintain the house and land, working towards eventual ownership. Other assets include the full range of office equipment and a growing collection of tools used in our various projects. AN’s day to day activities are funded by the proceeds of our shop in Dorohoi. The shop sells a proportion of the aid items that AN receives. This proportion is governed by statute to a maximum of 15% of the value of goods received; in a typical year the sales will be in the order of 10-11%. The shop does not sell any food or designated gifts, or any items where the donor has specifically requested direct donation. The shop also generates a small surplus which is used to provide cash payments towards family expenses, such as medical costs, electricity bills, school fees, etc. In a typical year AN makes up to 70 such donations per month. Capital expenditure such as house refurbishment or major vehicle repairs is dependent upon external assistance. Do you have any longer-term projects? AN has provided a range of expertise for several house-building or refurbishment projects; involvement with these properties is on-going. We have embarked on a project to provide long-term accommodation for a number of ex-orphanage young people who are currently of no fixed abode. Construction is now largely complete and the facility is in operation. Training is provided for staff and volunteers as opportunities arise. What can AN offer me as a potential donor? The satisfaction of an ethical re-use of serviceable items that might otherwise be discarded in landfill. The opportunity to help those in need through an established year-round organisation with hands-on experience of the local situation. Management of sponsorship funds and feedback to sponsors. AN is keen to partner with other organisations with similar objectives. We have facilities and local knowledge that can be made available to other charities or groups considering working in this area. We offer aid distribution and management of sponsorship programmes, all with full accountability and feedback; staffing and expertise for short-term projects, liaison with local authorities and introductions as required. All donations are subject to the availability of the necessary resources so the continuation of AN’s activities is dependent upon a steady supply of good quality clothing and other items. Transport of goods to Romania is a major expense so help with these costs is always appreciated. Finally, we currently have over 3,000 needy households registered with us, many of whom would benefit from regular sponsorship. The Biblical book of Nehemiah describes how a group of people were able to use the surplus resources of a wealthy nation to help to rebuild a broken society. This has parallels with the objectives of both AN and RoAF, and fits with the Christian principles of helping the poor. AN makes no demands of its beneficiaries with respect to religious affiliation or church attendance, but we are willing to talk with those who express an interest in spiritual matters. First, visit our website at www.roaf.org. Initial contact is best via email; alternatively call AN’s manager, Beni Mirauta, on 0040 744 198068. Str Spiru Haret nr 9, Dorohoi 715200, Botosani, Romania. A printable version of this page is available for download.